I found the large triangles of string fabric that are trimmed away as part of making the block to be too large and interesting to toss. The original directions for the block (on my blog, here), included the directions for making a second, smaller heart block. 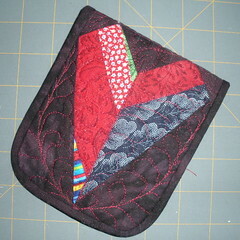 Of course, you don’t have to make heart blocks from those triangles. They could become butterfly wings or, you they could become fabric for making another block, like the star Wendy made two years ago. 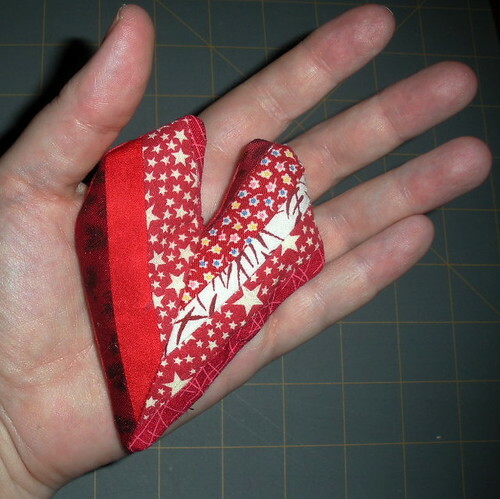 Personally, last time, I made a bunch of small heart blocks with the intention of making a doll quilt, but then started thinking about a bigger quilt using the off-cuts of string squares from another project … but somehow got no further than just thinking about it. Yesterday, I dug out my blocks and my extra triangles and some more turquoise background. I’ll add my low-volume bonus triangles into the mix and see what happens. Here are some example of projects using those bonus blocks/triangles. As you can see, I had some problems with some of the images. Follow the links for more details/better photos … until I can figure it out. 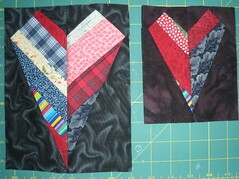 For a quick and easy project, how about fiber heart postcards to give or mail to your Valentine(s)? 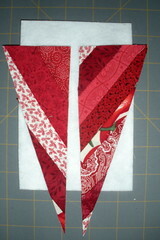 Two years ago, I trimmed down the left-over triangles with a 4 x 6 inch postcard in mind. Then I added some Timtex to make it stiff, added a little quilting, some satin stitch around the edge and a card stock back. 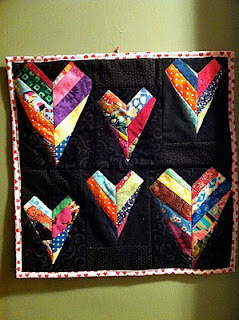 For a more artful valentine, look at this project posted by Terri Stegmiller yesterday. I think our low-volume string fabric would make a great background for stamping or stenciling, appliqué and decorative stitching. 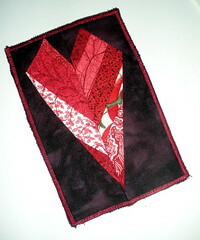 Use the heart (or other block made from the string triangles for the front of a note card–for Valentine’s day or any day. 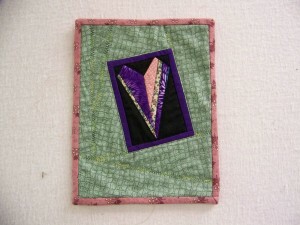 Make an auction quilt for the Alzheimer’s Art Quilt Initiative, like this one made by Laura from one of her bonus blocks two years ago. Ami and her foundation is sprinting to the finish this year and hoping to reach the $1,000,000 mark of funds raised for Alzheimer’s research. 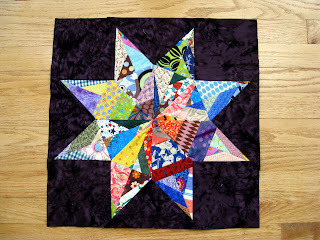 August 1, 2013 is the last day to register Priority: Alzheimer’s Quilts. If you always planned to contribute but never got around to it, this could be a good time to do so. 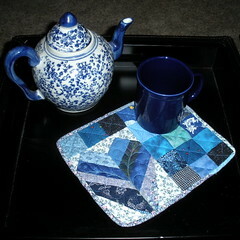 Make a mug rug. This is an oldie but goodie, that I made from a “fatter” string heart. Find the basics for designing your own here – Scrappy Mug Rug.If you like the proportions of the square heart block better, check out Kate’s blog for her String Heart Tutorial. 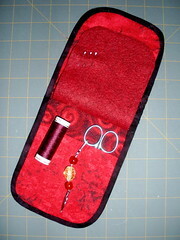 Make a 3-diminsional heart that you can hold in your hand, stick pins in or wear as a quilty broach. Find my basic directions, on Flickr, here. 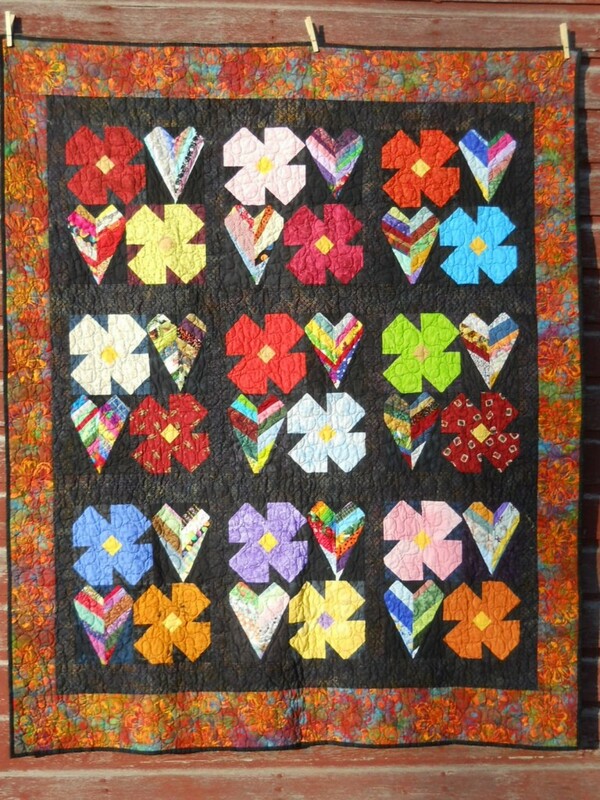 Of course, you CAN use the hearts (or other blocks you make) as a design elements in quilts … like these (from our Gallery). A Combination of Blocks (this was made from the lotto blocks, not the bonus blocks, but is such a good idea, I decided to include it). LOVE the butterflies! 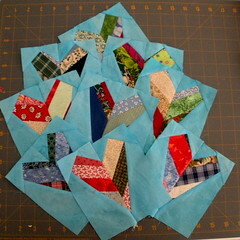 That would look nice staggered with the hearts for a baby girl quilt! …..it would be a fun block lotto block…?